One of my favorite restaurants in Astoria is Seva, not only because the food is made with love but also because of how affordable it is. If you haven't yet tried their $12 three-course dinner prix-fixe, I urge you to do so. No gimmicks, no tricks, just good food--and an added bonus is that it's still BYOB so you could bring your own bottle of vino. 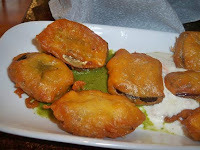 Eggplant Chat - Immediately liking this appetizer, it was fried with a light, fluffy batter, dressed with refreshing mint and tamarind chutneys. I think that this dish appeals to an American palate, as the texture very much resembles fried foods that are so deeply loved by our culture. The sauces are what made this dish stand out for me because they refreshed the senses and cleaned the palate after each bite. Just wonderful! 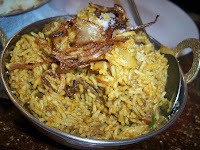 Lamb Biryani - Although this item isn't new to Seva, it was new to me. I adore slow-cooked dishes and knew that my tastebuds would agree with the tender lamb and deeply flavored rice that made up this entree. Liking how hearty it was, the portion was especially generous and I shared it with my dining companion, with plenty to spare for the next day. I'd recommend getting it cooked medium spicy, as you definitely taste the flavorful spice mix without overwhelming your palate. Once again, a cooling sauce called raita was served alongside it, restoring your mouth to serenity. Fruit and Nut Nan - You really can't go wrong with Seva's nans, which are baked in-house in their Tandoor oven. 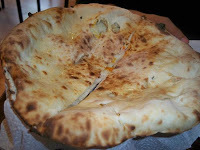 I've tried the rosemary, garlic and onion nan before but never the fruit and nut, so it was time. I just loved it--mixing sweet and savory is always up my alley and I enjoyed biting into the sweet bread after having a hearty forkful of lamb. Mango Lassi - Although a typical Indian drink, it was new and unfamiliar to me. There was nothing not to like, as it's basically a yogurt smoothie flavored with mango. While it's thick and filling, it's not quite as heavy as some mainstream fruit smoothies. The simplicity and clean flavors don't go unnoticed and I'd recommend getting it as a light dessert. Our servers were cordial, warm and attentive. That's just another thing that makes Seva special--their hospitality and nurturing atmosphere. There's never a time that I don't get asked how I liked everything and if there's anything else they could do for me. I always feel well taken care of and comfortable. The prices are as gentle as can be and make Seva an excellent dine-in or take-out option. Appetizers range between $3-$6, main courses are $8-$11, and as mentioned above, their three-course dinner prix-fixe is only $12. I welcome you to join me on my personal food adventures in Astoria and LIC - where there's always something delicious and tantalizing to explore. Want a great food job? Zucchini season is here, make quiche! Dan (aka the Hubbs) - Motto "I used to love wings & burgers, but now I do P90X and live on chicken, egg whites, and whole wheat." Peter (the bro) - Motto "I love a food challenge, bring it on...bring it all on." Vicky (the cous) - Motto "A skilled bakerella is who I am. Don't mess with me when it comes to sugar, flour and chocolate." Kimberly & Liser (tapas queens) - Motto "Pintxos, tapas, sangria, paella oh my! Me gusta." Moses & Sonya (token couple friends) - Motto "Brunch, brunch, brunch, we love brunch. Especially Eggs Beni." 3 Mmmms: Magnifico, must-have, seconds please?! 2.5 Mmmms: Very solid - worth spreading the news. 2 Mmmms: Pretty good, but my socks are still on. 1.5 Mmmms - Nothing to write home about. 1 Mmmm: Less than stellar, no doggie bag. Latest Activity on Why Leave Astoria?! A Fall Pie Party Potluck in NYC!